BCTEA » Should a SawStop be in Every School? Should a SawStop be in Every School? Steve Cecchi (SD #33 Chilliwack) – I have been teaching Grade 9 middle-schoolers how to use a table saw for over 20 years. Of all the machines and techniques that I introduce to these young builders, none are more intimidating for them than the table saw while at the same time, demanding of them a thorough and in-depth understanding of how the saw works. Over the years, I have strived to inform students as to the very basics of table saw operation, ripping and cross-cutting, how each type of cut is made, proper set up etc and the required safety devices available on table saws that keep operators safe: splitter (riving knife), kick-back guard, blade guard, cross-cut sleds, and push sticks. 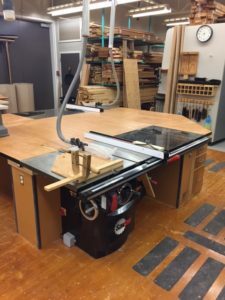 I take this approach with the hopes that if my students eventually encounter table saw work in other settings, particularly work sites or in their home garages, they will hopefully remember those safety devices that are meant to keep them safe. Being middle school students, and table saw users for the first time (usually), I check each student’s set up and supervise every cut made, allowing me to gauge a student’s understanding of what he/she is about to do, watch their technique (hand placement, body position, etc) intervene if I have to, and then provide immediate feedback following their cut. For years, I have taught on standard school issued cabinet-style table saws. Four years ago, I decided it was time to upgrade to the new Saw Stop technology and outfit our shop with 2 new table saws. All of our 5 district middle schools now use this technology. I have found the Saw Stop to be a very good table saw. Plenty of power (I have the 5 Hp version) that easily handles the basic cuts that students make on their projects. Easily adjustable uni-fence with positive lock that stays solidly locked in place. Smooth operating height and blade tilt wheels with large, easy to use lock-knobs. A large, paddle style power switch that can be kicked off by the operator if problems are encountered mid-cut (a great safety feature! ). And excellent guarding, including blade guard, riving knife and kickback fingers. It’s a great saw, and when you consider its safety feature (the Saw Stop technology), it becomes an exceptional saw. The piece of mind that it provides for me while I teach new users is immeasurable. When I first started using the saw with students I debated whether or not to explain to them how the technology worked. My thinking was that I didn’t want students to approach the table saw and think that it’s impossible for them to get hurt. I still try to impart to them the importance of knowing how a table saw works, the safe was to make cuts and the guarding that should be present on a table saw, because, as I said earlier, when students leave my shop, the next table saw they use may not have Saw Stop technology. Now, I teach students how Saw Stop actually works and I show them some video of our saw actually being deployed by a Saw Stop rep. They think it’s pretty cool. Four years on, I have not had a deployment of the Saw Stop. In my previous 20 years I never had a student injured while using a table saw. The only difference now, is I’m a little less stressed out when a new user fires up that machine for the first time! Paul Klein (SD#72 Campbell River) – I remember first seeing the Sawstop technology demonstrated at a BCTEA conference quite a few years ago. One of the salespeople from KMS ran a hot dog along a mitre gauge very quickly into the blade. The blade stopped immediately and hardly left a scratch! Apparently, when the blade senses hot dog (or flesh) it discharges a spring, allowing a sacrificial cartridge to be munched in the rotating saw blade and stops it within 1/3 of a revolution! Teaching in a crowded high school wood shop with students of all abilities and needs can leave one feeling a little nervous when the table saw starts up. Over the years we haven’t had too many mishaps—there have been a few kickbacks (one breaking a student’s belt buckle) and just last year we had an international student catch their fingers in the blade as it was winding down. We were crosscutting a 12” X 12” laminated panel (using the Excalibur crosscut fence) for the bottom of a serving tray. I demonstrated how to properly hold the wood and slide the fence system with the other hand. The panel was cut just fine, but as the saw slowed down, they felt the need to clear their offcuts away from the blade. As this happened it seemed like time stood still. I asked if she just put her fingers in the blade—“yes” she said, “but it didn’t even hurt.” I asked her to let me have a look and as she removed her other hand from holding the cut I could see that she had indeed caught her fingers in the saw. We fetched some clean rags, I shut the shop power off and walked her down to the first aid attendant. She ended up needing about 6 stitches but was very fortunate the cuts were not deeper. I had been requesting that our three cabinetmaking saws be upgraded to Sawstops for a few years, but it wasn’t until after this mishap that it finally happened. Our district was able to secure funding for 3 out of 8 saws last year. I chose to have the new saw replace our main “ripping” saw in the middle of the shop. We ordered the industrial 3 phase saw with the 5 hp motor, 52” fence and optional sliding crosscut fence. The difference in quality from our previous Delta Unisaw is incredible. The fence is dead accurate and easy to set, the on/off button is large and easy to reach, the dust extraction is much more efficient and the best feature of all—not the sawstop cartridge ready to spring into action if an accident happens—but the riving knife! It’s so much safer and easier to use than our previous “splitter”. As students performed various procedures (non-through cuts or thin cuts) each class, I’d always have to remove and re-install the splitter for them. Now the riving knife stays put, sitting right behind the blade and just below its surface. This small change has decreased risk levels big time! There were some reservations in our district that students may want to try setting the cartridge off to see if it really works or just farting around. There have been no attempts and students still have a healthy fear when using the machine. If you haven’t had a chance to check out this technology, I encourage you to look at the promotional videos online. I feel that if we as educators, responsible for student safety, know this technology is out there we should be vying to have it installed in our work spaces, not only to keep students safe, but to keep us safe!